Arsenal had their advantage at the top of the Premier League cut after Joe Allen's late equaliser gave Liverpool a deserved point in an Anfield thriller. Olivier Giroud's second-half strike - his second of the night and 18th of the season - looked to have put the Gunners on course for a crucial victory, but substitute Allen rewarded the hosts for a display bursting with energy and spirit with a low 90th-minute finish. Roberto Firmino twice gave Liverpool the lead in a breathless first half, the second a spectacular 20-yard drive, but Arsenal took advantage of poor defending from Jurgen Klopp's side to level through Aaron Ramsey and Giroud. 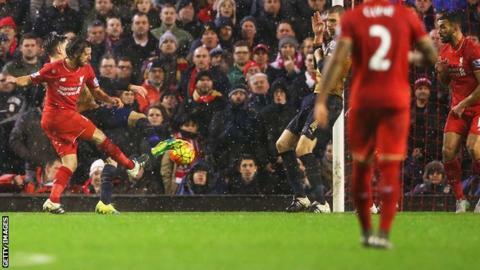 Giroud also missed an open goal in the first half, while Firmino struck the bar in a wide open game. With 10 minutes remaining, Arsenal's lead at the top of the table was four points. Yet Robert Huth's late winner for Leicester City at Tottenham and Allen's late strike left Arsenal only ahead of the Foxes on goal difference. The visitors looked to have finally established supremacy in this topsy-turvy encounter when Giroud turned to put them ahead 10 minutes after the break - but then failed to press home the advantage and paid a heavy price. And it will be a matter of concern to Arsenal manager Arsene Wenger that on nights like this at places like Anfield, they did not show the necessary ruthlessness to close out a game that was within their grasp. The Reds deserve great credit for the way they responded to the disappointment of going behind after leading twice - but Arsenal showed no assurance or authority when the pressure mounted in the closing stages and there was an inevitability about Allen's equaliser. Arsenal, when they should have been pressuring a desperately poor and under-strength Liverpool defence, instead allowed themselves to be pushed back. This was two points lost and Klopp will be the much happier manager. For such a regular goalscorer, Giroud remains a maligned figure by some Arsenal fans who regard him as just short of the highest class - and yet his strike rate speaks eloquently on his behalf. He showed a poacher's instinct to touch home his first from Ramsey's corner then showed good awareness and movement to turn Kolo Toure and score his second. And yet those who remain unconvinced by Giroud will point to his astonishing first-half miss when he somehow failed to convert Hector Bellerin's pass from a matter of inches in front of the Kop. Here, though, he demonstrated again that he will get goals and that is the best answer he can give to those who still doubt the France striker's pedigree. Liverpool keeper Simon Mignolet is poised to sign a new five-year contract at Anfield and has won the consistent backing of manager Klopp despite his fragile form. And yet he was once again a very obvious weakness behind a Liverpool defence that was an accident waiting to happen for large portions of this enthralling game. The 27-year-old Belgian was beaten too easily inside his near post when Ramsey equalised after Firmino's opener, then was hopelessly stranded as Giroud's faint touch allowed a corner to sneak in. It was desperately poor keeping. For all Klopp's public assurances - he would not do otherwise - he must surely be concerned at Mignolet's obvious frailty, alongside the glaring inadequacy of his deputy Adam Bogdan, as proved by his errors at Watford and Exeter City. Liverpool have recalled 22-year-old Welsh keeper Danny Ward from a successful loan spell at Aberdeen so he is now in the mix - but Klopp has to consider a more reliable, experienced long-term solution after Mignolet's latest blunders. Liverpool manager Jurgen Klopp: "We started so good and played good football. It showed all of us how good we could be. "Then we concede a goal from a set play and we have to work at it. Organisation is one thing and sometimes we have a little problem with concentration. "We gave them two easy goals after we had to work really hard for our goals. We had many moments which I am happy with." Arsenal manager Arsene Wenger: "I'm very disappointed but, overall, I cannot fault the effort and commitment of the team. "We had a difficult start. At 3-2, we should have made it 4-2 and didn't make the right decision in the final third. "Liverpool fought until the last second." James Milner made his 300th Premier League start in this fixture. He provided his first Premier League assist v Arsenal in his 23rd game against them. Liverpool don't have long to recover before they entertain fierce rivals Manchester United on Sunday (14:05 GMT). Arsenal's next game is a trip to Stoke, where they have failed to win on their past five Premier League visits, on Sunday (16:15 GMT). Match ends, Liverpool 3, Arsenal 3. Second Half ends, Liverpool 3, Arsenal 3. Goal! Liverpool 3, Arsenal 3. Joe Allen (Liverpool) right footed shot from the centre of the box to the bottom left corner. Assisted by Christian Benteke with a headed pass. Nathaniel Clyne (Liverpool) wins a free kick in the attacking half. Substitution, Liverpool. Steven Caulker replaces Adam Lallana. Corner, Liverpool. Conceded by Mathieu Flamini. Attempt blocked. Jordon Ibe (Liverpool) left footed shot from outside the box is blocked. Assisted by Joe Allen. Offside, Liverpool. Nathaniel Clyne tries a through ball, but Roberto Firmino is caught offside. Offside, Arsenal. Olivier Giroud tries a through ball, but Kieran Gibbs is caught offside. Substitution, Liverpool. Joe Allen replaces Emre Can. Attempt blocked. Christian Benteke (Liverpool) right footed shot from the centre of the box is blocked. Assisted by Jordan Henderson. Corner, Liverpool. Conceded by Kieran Gibbs. Corner, Liverpool. Conceded by Per Mertesacker. Attempt blocked. Adam Lallana (Liverpool) right footed shot from the centre of the box is blocked. Assisted by Emre Can. Substitution, Arsenal. Alex Oxlade-Chamberlain replaces Joel Campbell. Attempt missed. Alberto Moreno (Liverpool) left footed shot from the left side of the box is too high. Assisted by Adam Lallana. Attempt saved. Christian Benteke (Liverpool) right footed shot from the left side of the box is saved in the centre of the goal. Assisted by Adam Lallana. Attempt missed. Roberto Firmino (Liverpool) header from the centre of the box is close, but misses to the right. Assisted by Alberto Moreno with a cross following a corner. Corner, Liverpool. Conceded by Joel Campbell. Corner, Liverpool. Conceded by Nacho Monreal. Attempt blocked. Roberto Firmino (Liverpool) header from the centre of the box is blocked. Assisted by Alberto Moreno with a cross. Substitution, Liverpool. Christian Benteke replaces James Milner. Attempt missed. Jordan Henderson (Liverpool) right footed shot from outside the box misses to the right. Assisted by Emre Can with a headed pass. Foul by Jordon Ibe (Liverpool).